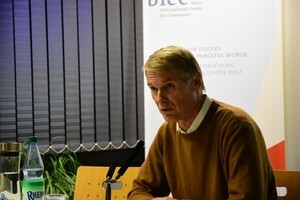 BICC Press/Events/Panel discussion \ Peace negotiations with Jihadists? 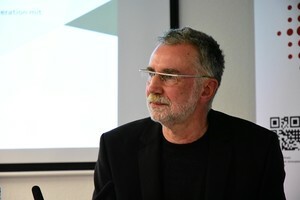 You are here: Home » Press » Events » Panel discussion \ Peace negotiations with Jihadists? Panel discussion \ Peace negotiations with Jihadists? The Journal Wissenschaft und Frieden (W&F) and BICC invited to the panel discussion “Peace negotiations—with so-called Islamic State and other Jihadists?” (in German language) on Friday, 27 January 2017. The current conflict in Syria makes one wonder what the conditions for a successful peace process ought to look like. One central question is who is likely to participate in the negotiations: Ought certain actors be discredited and excluded or should all, regardless of their political or religious belief, participate in it. Central to this discussion is the question of whether groupings such as so-called Islamic State and other radical Islamist groups are suitable partners in this process. 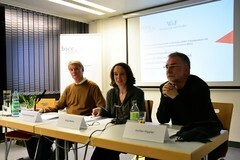 Moderator: Dr Katja Mielke, BICC. Thomas Carl Schwoerer (l.) and Jochen Hippler (r.) discussed chances and risks of peace negotiations with so-called Islamic State. 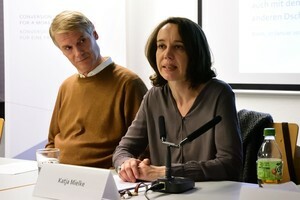 Katja Mielke moderated the panel discussion. 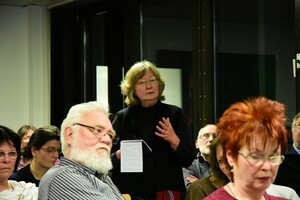 Karin Leukefeld, journalist, (standing) giving an input.